Robotics is playing an increasing and high profile role in society, and robots fascinate people. The new National Curriculum is the perfect push to get robots into schools. As a school, we have had some experience of robots in the form of the brilliant LEGO NXT Mindstorms and LEGO Education WeDo and these resources have provided students with an excellent grounding in robotics. Such platforms have helped give students a great understanding of programming and indeed the opportunity to build and develop their own robots. Having stimulated an interest, we have students who want to further their experiences in this field. What exactly is possible? 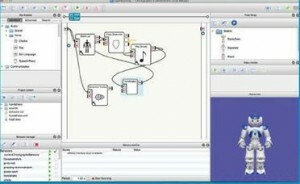 I had received a days training on NAO and soon got to grips with him and his software. Before long I was walking him, speaking to him and allowing my imagination to run away with the possibilities that he would bring to our school and my classroom. The aspects that often frustrate with some technology based ideas, is the actual implementation. The setup of NAO was straightforward and logical and he helpfully informs you himself of any difficulties. We had focused our efforts on a group of Year 12 Computer Science students. They used their lesson time to programme NAO to carry out some tasks including speaking in different voices, waving, moving and walking. The students worked for three weeks (together with the Head of ICT and her staff) to further develop their programming skills with voice and face recognition. Both staff and students soon came to terms with Choreographe, the programming software that drives NAO. The simple layout of the software is ideal for all users, with further more complex aspects to the software that the students can simply click down to – when they are ready. It is great software for experimenting – the virtual NAO in the software allows the vast majority of programming to be done away from the robot – ideal when there is only one robot. Students were soon letting their imaginations run wild. It was great to see the ideas that the students had and the solutions they then developed to brings these ideas to fruition. Each lesson brought a new challenge and a greater depth to learning. I have also seen a freedom in the students to try things out – to get things wrong – only to see them regroup to discuss the next development in creating a better piece of programming. The freedom of sharing ideas and indeed the pride of sharing new found knowledge fills my classroom. As a process I can see that it has already changed how many of the students viewed this area of ICT, a rather under developing area in education until now. 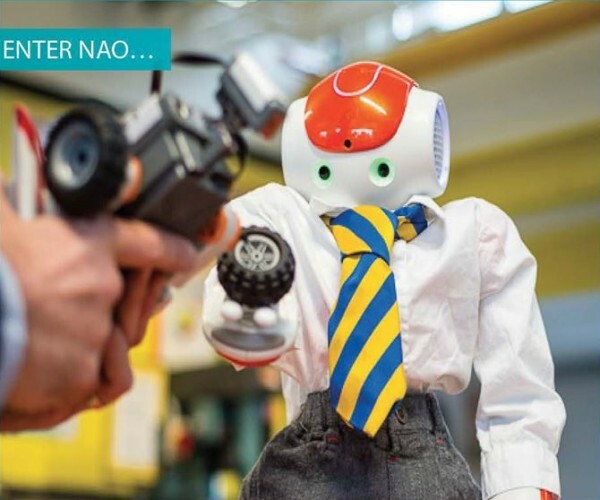 In a country that has recently highlighted a huge gap in the engineering workforce, it is opportunities like working with NAO that will help them close this gap as students see the challenge and excitement that these areas of work present. 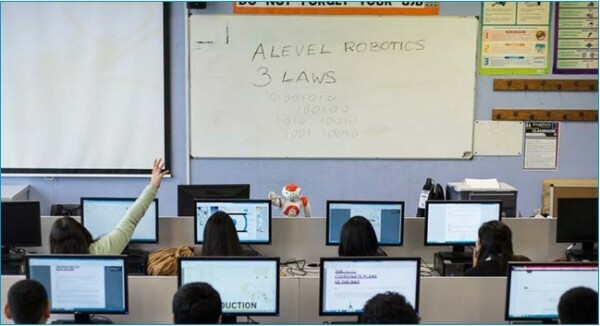 The Computing students worked alongside Head of ICT, Ms Sanghani and E-Learning Manager, Mr Fuller to program NAO using advanced programming techniques such as voice and face recognition. They were able to make effective programs that could be used in the school environment for example: calling out a register and waiting for a response, teaching the French language and reading out notices in an assembly. NAO was welcomed to KHS by our Head Boy and our Head Girl. He even joined the student roll – he has never got a late mark on the register! He was even issued with very own birth certificate and uniform. He became a true member of our Kingsbury community. Most importantly, he has spent a lot of time out and about so that as many students as possible can have access to him. NAO has been used in many different ways within the school. He has participated in school assemblies where he has introduced himself and handed out our reward certificates. He attended, and became a highlight of, the school fete where he demonstrated his amazing dance routines. In drama/ dance classes, students have been happy to include him and have been inspired by his dance moves. NAO regularly showed off his moves such as his ‘Gangnam Style’ and ‘Thriller’ dances. NAO also played games with students – “Mimic a sport”. 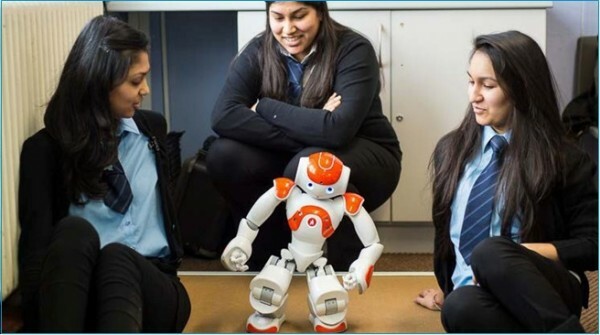 It was great to see students walking with NAO down the school corridor – humans and a humanoid in harmony. These routines get students asking “How?” and “Why?” A great way to develop an interest in learning and a much needed interest in the area of computing and engineering. NAO also took time to meet the parents of students at one of our Open Evenings. Students programmed him to meet and greet parents upon detecting a human face. This created a topic of superb discussion and was a great way of students showing off their programming skills and showing parents the latest technologies that are available. “The aim was to give the computing students an opportunity to program the robot in various ways. My task throughout the couple of weeks we had NAO was to program it in a challenging way in which would benefit the staff if Kingsbury High was to have one. Working alongside my class, I had programmed the robot to recognise people’s faces and voices as if it was taking a register where NAO would use his camera to detect and compare against a picture in his memory to pick out the correct individual, translate and speak back to people in different languages and carry out a series of tasks in order for example, greeting, what the lesson will be on and taking a register. As part of this experience, I grew fonder of computing as a subject, which made me want to learn how to code in various languages such as pHp, java, python and visual basic. This was the starting of my desire for wanting to take computing further and wanting to take Computer Science as a degree…” Which she will start in September!